Getflix is mediocre service for VPN needs, especially for streaming restricted channels. The pricing plans are economical to give a shot. The website is helpful with 24/7 customer support. You cannot get Getflix VPN services only, customer needs to sign up for SmartDNS too. There are no anonymous payment options available. This is one of the biggest drawback of the service. 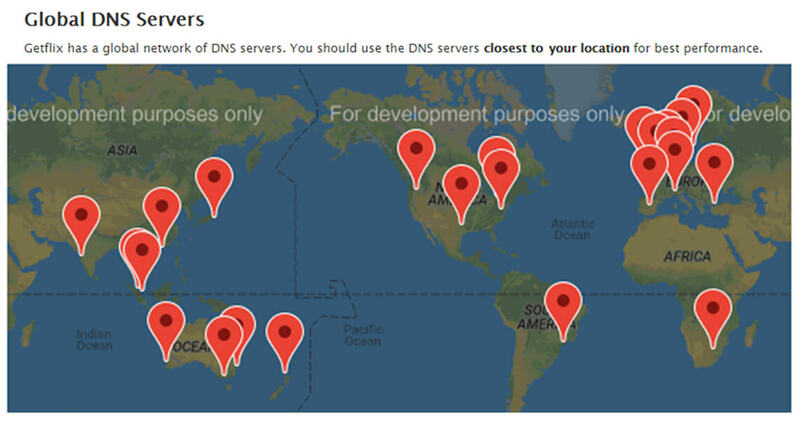 Overall, it’s not a bad idea to have a SmartDNS with a VPN service for the sake of streaming. Streaming more than 200 channels including Netflix in a couple of bucks is not a bad deal at all. Getflix is a brand of Global stealth Inc. The company has started back in 2012 and has more than 200 music and video streaming services including; Hulu, Amazon, BBC, etc. for you to unblock from anywhere. Don’t worry! 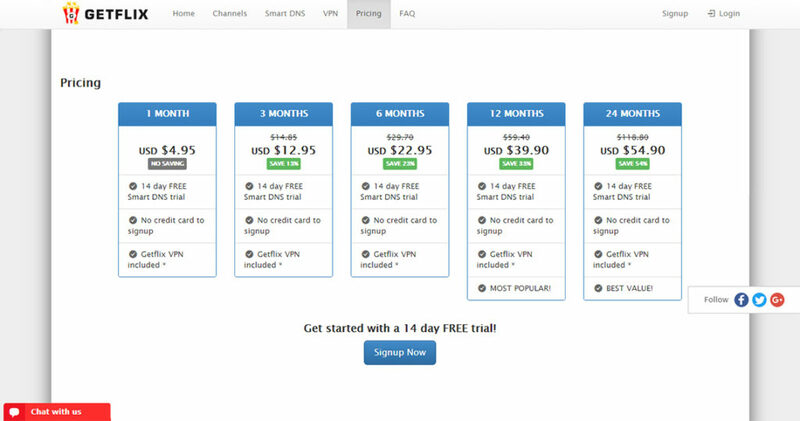 The service offers five different plans to choose from and you have 14 days to test drive their SmartDNS services without having to pay a single penny. Getflix is one of the DNS services that use VPN to hide IPs and protect privacy. Global stealth Inc. is located in Revolution Avenue Victoria, Seychelles, the exact location of Getflix is invisible on their website; God knows, from where Getflix is operating their services. What is so different About GetflixVPN? The two things which is highly demanded by the VPN users and not all VPN providers are able to offer these features are Netflix support and a VPN that works in China. So, does Getflix VPN offers these features? Since Netflix has robust VPN detection systems, that are continuously taking down IP addresses from VPN servers; only a fraction of VPN services can bypass Netflix detection mechanism. Unfortunately, Getflix used to shaky moments with Netflix but currently allowing access without any proxy or related error. Other than Netflix, the service supports more than 200 streaming channels. Although Getflix has had its ups and downs with Netflix and other favorite streaming channels but isn’t great that it’s one of the rarest VPN services that can still outsmart the popular entertainment and allow you to watch your favorite content from anywhere. ✎ Read Also: Netflix is restricted around many countries of the world, there are many VPN providers that cannot do the job of unblocking Netflix except some VPNs. If you’ve never been to mainland China may be taken aback because once you are there, you’re unable to access most of your favorite sites or those that you use daily. Getflix VPN servers are scattered throughout the entire world, including China and currently, Getflix has three servers within China. Now, let’s explore the services being offered by the VPN provider, so that you can decide whether the service worth to give a shot or not. Shall we begin! Getflix, being a mediocre VPN provider boasts 91 servers with 10000 IPs scattered across 39 countries. Getflix also offers SmartVPN servers; a combination of Getflix SmartDNS and full VPN. These servers do not only encrypt your connection with high-end ciphers, but also grant you access to sites like Amazon Prime, Zattoo, Pandora, HBO, and Hulu; don’t worry about the speed. Getflix supports all popular protocols, including OpenVPN (TCP and UDP), L2TP/IPSec, PPTP, and SSTP. OpenVPN, one of the most secure protocol uses the Handshake method using the best RSA-2048 bit encryption to offer fast speed and excellent security on all the mainstream OS and devices. The only downside with OpenVPN is that it’s somewhat complicated to operate. L2TP is also a secure and all-devices supported protocol that uses remarkable and robust 256-bit military-grade encryption. L2TP is simple to setup and offers breakneck speed. PPTP affords the standard 128-bit ciphers at relatively a reasonable speed and subject to some disconnection. This simple-to-set protocol provides fast speed, but some ISPs throttle this protocol that slows down the speeds. SSTP supports 2048 bit encryption, with simple to use interface and secure enough to be used only with Windows OS. SSTP is slower than PPTP and L2TP. It is a service available to all Getflix SmartDNS subscribers. To use the VPN, you need to download OpenVPN protocol, fetching the details from the Getflix website. Frankly speaking, manual setup is something that we are not crazy about, but we assure you that the instructions are way more comfortable and time-saving. The client is pretty primary and most of the settings are just one or two clicks away, and further customization is equally straightforward. To review Getflix, we carefully examined the entire website to find any warning signs or concerns with regards to privacy and security. However, the service provider checks out in all the aspects; you will see an easy to understand and straightforward policies with a plain ‘NO LOGS kept in the network’ statement for your VPN traffic.’ we didn’t find any detail on session management – what’s collected and what’s not. The small-print is also silent about how the company handles government requests for data; even the exact location is missing. I don’t know how a VPN service is hiding users’ locations without informing their location. In short, Getflix does not collect, track, or log any of your data, except whatever you want to share. To build customer support better, the company encourages users to share some info. Also, they claim that they never give your information to a third party, without your consent. Getflix is quite simple as compared to sophisticated methods of other VPN providers; subscribe with an email address and password and then download in your favorite screen, here you go. If you own any of the devices mentioned below, you can quickly draw Getflix services. Don’t worry! You don’t need any additional software for setup; find easy-to-understand guides for all the mentioned platforms. For your convenience, guides are topped up with useful pictures, which makes the installation process more manageable, even for the novice user. As you visit the Getflix website, you’ll enter into the world of information in displayed yet organized manner; so spare some time before going through its website. But, make sure you need to navigate around to search the relevant data. Let’s talk about Getflix FAQ section, which has almost all the solutions of all the possible queries related to its services. Don’t be stressed! FAQs are self-explanatory, so does the steps of all the protocols across all the supported devices. Unlike others, Getflix VPN has customer support that works 24/7/365. To submit a support ticket, you need to login to get the prompt response and for live assistance, click the red tab and sign in with your name and email or else connect via Getflix social media; make inquiries via Twitter, Google+, and Facebook. The strangest part is, customer support does not have an email address so, you can’t email them. Getflix does allow P2P/Torrenting, using unlimited bandwidth and with no restrictions on downloading. Share your files instantly with uninterrupted connections using multiple VPN gateways and keep your identity anonymous. The provider does not record/log any information, but yes, you will not be entertained if you find downloading illegal torrents. Find the list of torrents here that grant P2P/Torrenting. Let me remind you Netflix’s primary product is smart DNS, that’s why you cannot buy their VPN service alone – Sign up for a DNS plan and get the VPN freely. The monthly plan is useful if you’re an occasional traveler, rest 24-months’ plan is relatively better with the greatest discount threshold. For a test drive, opt their 14-day free trial plan, but there’s no VPN in the free trial. Getflix accepts all popular methods of payment, including through JCB, American Express, Discover, MasterCard, and Visa using their secure payment gateway. There’s no anonymous method to pay for Getflix like Bitcoin; isn’t surprising that service sells anonymity but doesn’t practice anonymity. Unfortunately, Getflix does not afford refund or money back guarantee; as you still have 14-days to try but again to subscribe for a VPN, you’ve to get one of their paid plans. Getflix is an impressive service among entertainment seekers, but their primary focus is SmartDNS, VPN is their primary reason to survive. The best thing is the number of channels with impressive geographical servers across global servers and the availability of different protocols for different needs. The compatibility follows the standard platforms, and so does the five simultaneous connections. Diversified pricing plans are yet another attractive feature topped up with the 14-day free trial, but not for VPN seekers. Unavailability of anonymous payments and invisible existence would possibly turn avid VPN users.